Before this post, when you searched for "sunflower seeds" on our website, only one result popped up. And that reference was minor at best; Bryce Harper's dad pitched him sunflower seeds to improve his hand-eye coordination. That was unacceptable to me. Leader of the resistance and so-called baseball fan, Keith Olberman raised quite a stir on Wednesday night with this tweet. 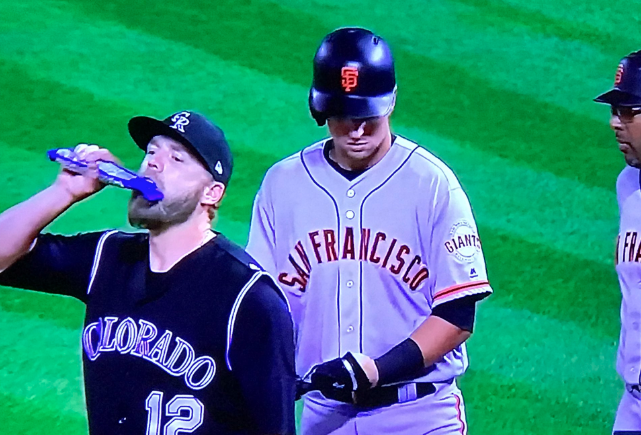 Of course, Mark Reynolds is eating sunflower seeds. As many fans pointed out in their replies—please read through them—this is a very normal baseball activity. Baseball is great for many reasons (100 to start), but the fact that you can snack on sunflower seeds while playing is definitely one of them. I know Keith is a solid baseball fan, so I won't give him any more crap. We all make mistakes. Instead, here are my favorite sunflower seed baseball gifs.